Wireless computer peripherals provide a world of convenience when working through everyday tasks on a computer. They aim to solve one of the most daunting aspects of using several computer accessories – being bound to a PC with several pesky wires. Owing to their increasingly popularity for more reasons than one, buying the best wire-free keyboard and mouse can be a bit overwhelming given the myriad of options available. Unlike most other products in its segment, he E-Gi.IT Wireless Keyboard and Mouse Combo steps it up a few notches with its energy- and space-saving design and its ability to help you be more productive without disturbing your neighbors thanks to its whisper-quite keys. Available in a choice of three exciting colors – rose gold, silvery, and silvery-2, both the wireless devices in this set connect with Android and Windows operating systems over a 2.4 GHz uninterrupted signal, and can be used from up to 10 meters away from your PC. Further, both the E-Gi.IT MAC-PC style wireless mouse and keyboard are fitted with premium quality components, all neatly arranged in a dust-proof, easy-to-clean electroplated shell. Measuring a compact 15.3 x 5.7 x 1.58 inches and weighing no more than 2 lbs., the devices are easy to carry around and offer long battery life. Adding to this, the wireless mouse in this set can be placed in its dedicated slot under the device when not in use to avoid misplacing it. The keyboard of included in this combo doesn’t fall short in the feature department, with its luxurious feeling low keys, indicator buttons, digital keypad and multimedia buttons. The E-Gi.IT MAC PC style is an excellent choice for both beginner and professional computer users and mimics the design and tops the performance of most Mac keyboards. Given its sleek and extremely lightweight footprint, it is also a wise option for users who carry their computer accessories on the road. Considering its long working range, it is a good choice for gamers who’d like to play their favorite titles wire-free, and from a farther distance away from their Windows and Android powered systems. Both the wireless mouse and keyboard in this combo showcase robust build quality, and can be ordered in three different colors, making it easy to match the elegance of other computer accessories in your workspace. The DPI (dots per inch) of the E-Gi.IT MAC PC style wireless mouse can be adjusted according to user needs, and offers accurate, smooth and precise scrolling. Additionally, they connect quickly to the included USB nano receiver plugged into one of the available USB ports on your computer, and without any complicated software installation. The E-Gi.IT MAC PC style wireless keyboard and mouse come with a myriad of innovative features, some of which often only seen in much higher priced models. PC’s and computers today are available in a spectrum of colors, and E-Gi.IT MAC PC style combo can be had in a choice of three color options to match including rose gold. The two devices included in this wireless combo set connect over a lag– and interference-free 2.4 GHz signal. This industry standard connectivity also allows you to use the computer from a fair distance away. When fully charged, the laptop and mouse can be used for months on end, and even feature a low battery indicator to let you know it’s time to replace the battery. The keyboard is appointed with whisper-quiet, enhanced scissor-style keys, multimedia buttons, a Num, Caps and power indicator and measures 5.4 inches in length. The mouse measures 2.3 inches in length, and is equipped with a DPI gear adjustment button, right and left click buttons and a smooth-scrolling mouse wheel. At the bottom of the mouse you will find the battery compartment, photoelectric engine, nano receiver storage compartment and its storage compartment. The E-Gi.IT MAC PC style wireless keyboard and mouse offer plug-and-play simplicity, and are compatible with most versions Windows OS including Windows XP and Windows 10 and Android based systems. To get started with the two wireless peripherals, remove the nano receiver stored in its compartment at the bottom of the mouse next to the battery compartment, insert the batteries into each dedicated slot, and then plug the nano receiver in an available USB slot on your computer. The devices once turned on will automictically detect and connect with the nano receiver, and the mouse and keyboard are ready for a wireless performance. Take note that the keyboard and mouse will enter sleep mode after 5 minutes of inactivity, and can be re-enabled by pressing any key. The E-Gi.IT MAC PC style wireless keyboard and mouse combo rings in with a rich set of features, and is built to last for years on end with proper care. Although the devices are fitted with soft buttons and keys for enhanced comfort, they lack a 100 percent ergonomic design. Therefore, they may not be the best choice for those experiencing muscle strain and other similar issues. For a keyboard and mouse that reduces stress while typing and one that comes with an integrated palm rest, the Logitech MK550 Wireless Wave Keyboard and Mouse Combo is worth a second look. The E-Gi.IT MAC PC style wireless keyboard and mouse combo tops the charts in terms of build quality, design and performance. It arrives with an extensive list of features, and is easy to use by inserting the included nano receiver in a USB slot with no software setup. 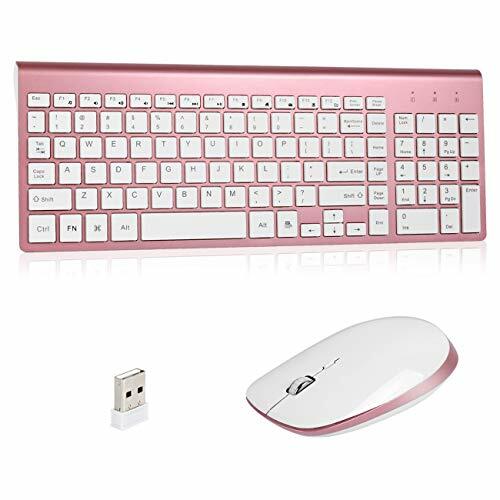 For a wireless keyboard and mouse that offer interruption-free connectivity, the E-Gi.IT MAC PC style wireless keyboard and mouse set is an investment you can’t go wrong with.